Continuing our studies on indigo 1, we turned our attention to the first indigo synthesis. At that time the structure of indigo was unknown and it was proposed until thirteen years later but then it was considered to be a cis compound. However, modern crystallographic studies showed a trans structure 2. The isatin structure was not yet well established, thus the Baeyer-Emmerling indigo synthesis starting from isatin is an example of inference. Since isatin had been obtained by oxidation of natural indigo, they tried the reduction of isatin, but first they converted it into a chloro derivative, more prone to reduction. Two products were obtained, indigo blue and the previously unknown indigo red. However, this has proved later to be helpful in cancer treatment. This little-known indigo synthesis has been brought up to date giving the reaction mechanisms and the pertinent chemical names. The first synthesis of indigo was accomplished in 1870 by Baeyer and Emmerling 3, 4. They employed isatin as starting compound due to the fact that Laurent in France had obtained it from indigo by treatment with nitric acid 5, 6. We give a translation of the experiment because the method is clear and complete and can be helpful. Since his communications have not neither structural formulas nor reactions, we provide both, as well as the reaction mechanism. Laurent discovered a new compound by oxidizing indigo and named it isatin. It forms large red prisms that are similar to those of red potassium ferricyanide. He added in portions nitric acid over a slurry of indigo and water in a porcelain dish, heating with a moderate flame. A vigorous effervescence of nitrous vapours is produced (fumes hood). Nitric acid is added until the blue colour disappears and the liquid turns yellow, indigo-HNO3 (10:7 in weight). The mixture is diluted with water, boiled and filtered. Isatin is soluble in hot water, little in the cold. After 12 hrs isatin is deposited as small reddish crystals. The solid in a funnel is sprayed with water containing a little of ammonia, this removes a soluble brown resin, and washed with water. Isatin crystallizes from alcohol in transparent, shiny, red brown prisms. It melts and spreads very irritant yellow vapours. 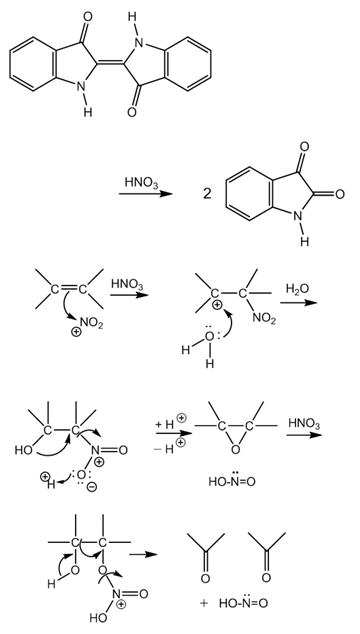 The reaction and the mechanism are in Figure 1. The first step is an electrophilic addition of nitric acid to the double bond, initiated by a nitronium ion. 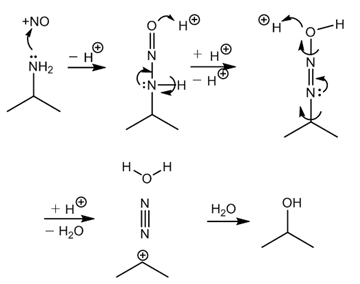 Protolysis of the adduct promotes an oxide-reduction reaction in which nitrous acid and an epoxide are formed. Ring opening by nitric acid yields an alcohol and a C-nitrate. A subsequent protolysis gives rise to nitrous acid and two carbonyl groups result by a C-C fission (second oxidation step via concerted electron movements). The nitrous acid is dehydrated by heat to nitrous anhydride (N2O3) and this yields nitric oxide (NO) and brown ‘nitrous vapours’ of nitrogen dioxide (NO2). It was until 1869 that Kekule 7 proposed a structural formula for isatic acid and also for isatin, just one year before the Baeyer-Emmerling indigo synthesis. He considered isatic acid was o-aminophenylglyoxilic acid (o-aminobenzoylformic acid) and isatin its lactam (2,3-dioxoindoline). Figure 2. Since the isatin syntheses were posterior to the Baeyer-Emmerling indigo synthesis, they must have employed isatin obtained from indigo. However, we will mention two isatin syntheses that were then contemporary since the original Baeyer-Emmerling synthesis was improved for ten years. One isatin synthesis is due to Baeyer and the other is from Claisen and Shadwell. In 1878 Baeyer published the synthesis of oxindole 8, 9 and of isatin 10, 11. To obtain oxindole (2-indolinone), a precursor for isatin, he nitrated phenylacetic acid with fuming nitric acid, heating in a water bath. The mixture of isomeric nitro acids, after the expulsion of nitric acid, was reduced with tin and hydrochloric acid. The liquid, after precipitating the tin with hydrogen sulphide, was concentrated, neutralized with marble and boiled with barium carbonate for a short time. The isomeric amino acids form barium salts, but not the ortho acid since it is in solution as anhydride (lactam). Ether extraction yields the oxindole, mp. 120°C. Figure 3. The Baeyer isatin synthesis confirmed the structures proposed by Kekule for isatinic acid and isatin. Figure 4. The first step is oxindole nitrosation. It is interesting because it points out the importance of 2-hydroxyindole as isomeric structure of oxindole since for nitrosation a double bond at that position is required for reaction to occur. We provide the mechanism in Figure 5. Nitroso oxindole was reduced to 3-aminoxindole and oxidized to isatin by means of cupric chloride, or ferric chloride or by nitrous acid. 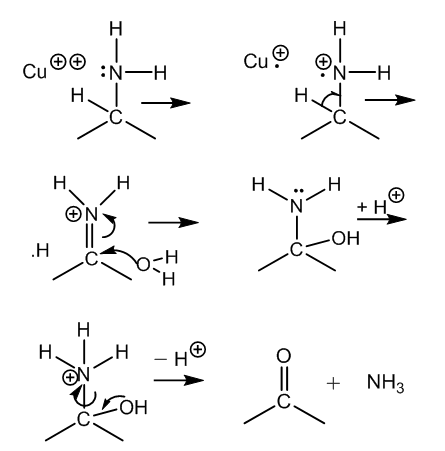 The mechanism with CuCl2 is given in Figure 6. It is a typical example of an ion-radical process. 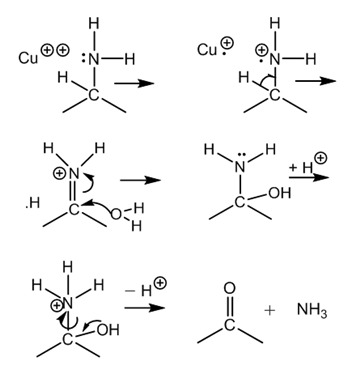 The reaction of the amino compound with nitrous acid, a van Slyke type reaction, yields the alcohol, not the ketone, and thus there is need of a further oxidation (not mentioned). 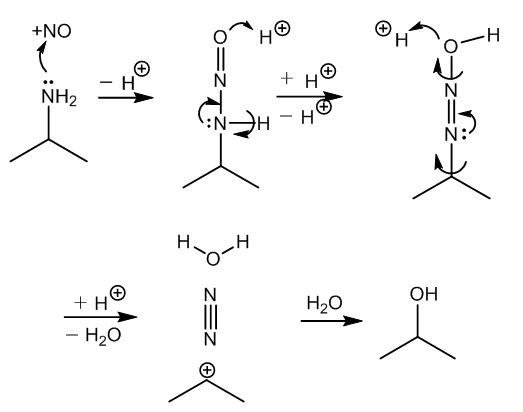 The nitrosamine isomerizes (prototropy) and the hydroxyazo group loses water and nitrogen by protolysis. Finally, water reacts with the resulting carbocation. Figure 7. The Claisen-Shadwell isatin synthesis was published one year later 12, 13. They started from o-nitrobenzoic acid, transformed it to the chloride with phosphorus pentachloride and then to the cyanide by means of silver cyanide, heating at 100° in sealed tubes. Concentrated hydrochloric acid gave the amide. The o-nitrobenzoyl-formamide is extracted with ether and crystallized. Hydrolysis with a dilute solution of potassium hydroxide at 100° yielded the potassium salt of o-nitrobenzoylformic acid. The o-amino compound was obtained by reduction with ferrous sulphate in alkaline medium. The ferrous sulphate is added gradually and the ferric hydroxide is filtered. Finally, treatment with hydrochloric acid afforded the free isatinic acid (o-aminobenzoylformic acid) which cyclizes to isatin. Figure 8. With the purpose of update the Baeyer-Emmerling indigo synthesis we will mention two additional syntheses of its starting compound, isatin. A classical preparation of isatin is that of Sandmeyer 14 which has been improved two times, one in Organic Syntheses 15 and the other in 1989 16. 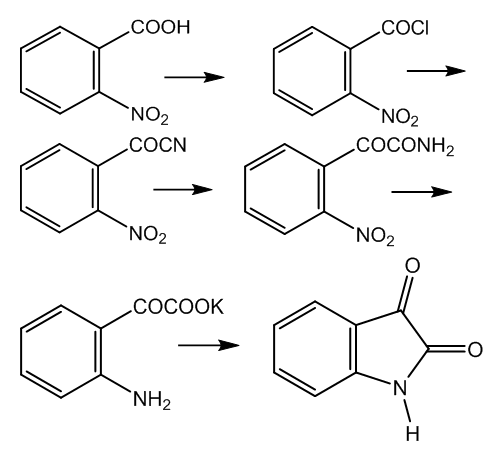 In this method the following reactions take place. Figure 9. Trichloroacetaldehide can form a solid adduct with hydroxylamine which can be dehydrated to the oxime. A chlorine atom is eliminated by a further reaction with aniline. Hydrolysis of a second chlorine atom yields an unstable chloro alcohol which forms a carbonyl group (amide). The resulting compound is isonitrosoacetanilide and it is isolated. The anilide is cyclized by means of sulphuric acid. The formed hydroxylamine is dehydrated to the imine which by hydrolysis furnishes the isatin. Reaction at the oxime hydroxyl group (Beckmann type rearrangement) can also favour the cyclization step and the same imine can be formed. A recent method to obtain isatin and substituted derivatives is by oxidation of indoles by I2/TBHP (t-butylhydroperoxide) in DMSO at 80° for 24 hrs. The substituents can be at the N or in the benzene ring 17. The Baeyer-Emmerling indigo synthesis 3, 4 initiated in 1870 was continued by Baeyer in the late seventies and in 1881. They took into account that isatin had been obtained by indigo oxidation. So they tried the inverse reaction, isatin reduction. Isatin was chlorinated by means of phosphorus trichloride making use of the lactam-lactim (imidol) isomerism. Cf. Figure 5. The obtained ‘isatinchloride’ (2-chloroindolenin-3-one) was expected to be more reactive than isatin itself. In a one-pot experiment they included fine ground isatin with 50 times the weight of a mixture of equal parts of PCl3 and acetyl chloride, and a little phosphorus (as reducer). The reaction mixture was heated at 75-80° for several hours in sealed tubes. The light green liquid gradually turns blue and sets off dark blue granular powder. This is filtered off from the clear yellow mother liquor and washed with alcohol to remove a red dye (indigo purpurin) soluble in it. The blue substance volatilizes in purple vapours, which condense to large blackish glittering metal needles (indigo blue). Yield, 10-20%. Eight years later 18, 19 Baeyer communicated substantial experimental modifications to this synthesis. Instead of the excessive amount of phosphorus trichloride and acetyl chloride he used phosphorus pentachloride and the reaction was not carried in a closed system but in an open one. This permits the free emission of hydrogen chloride and favours the reaction ongoing. Isatin was gentle heated with PCl5, so a lively combination-reaction with HCl evolution went quickly, while the solid turned red-brown. Upon water addition a brownish-yellow solid separated, which is not soluble in sodium carbonate, whereas potash yields isatin. Notwithstanding the difficulty to obtain this substance in pure state, no doubt that it is the imide chloride of isatin, and has the formula shown in Figure 10 and the mechanism of chlorination via the amphion. Isatin chloride provides indigo by reduction when a small piece of yellow phosphorus is added to the reaction mixture and warmed gently, and the red colour of the mass changes to green. Indigo blue precipitates after addition of water and a brief boiling. Treatment of an alcoholic solution of isatin chloride with zinc-dust and acetic acid also yields this dye by boiling the liquid mixed with water. Indigo formation proceeds most smoothly using ammonium sulphide. The mass obtained by the action of PCl5 on isatin is washed first with water, then with sodium carbonate and the residue is immediately dissolved in an alcoholic solution of yellow ammonium sulphide. On boiling the liquid turns green and becomes bluish upon addition of water and after repeated boiling, heavy flakes of indigo blue settle-out of the fluid turned milky by the formed sulphur. The yield is very good by these methods, but the indigo blue is always accompanied by smaller or larger amounts of indigo purpurin. In a third communication 20, 21 quantities are given as well as other values. For the preparation of isatin chloride, isatin (5g) with PCl5 (6-7g) and dry benzene (8-10g) in a flask equipped with a cooling tube are heated on a water bath. After the very vigorous evolution of hydrochloric acid has ceased, all the isatin has dissolved and a dark brown liquid has been formed, which solidifies on cooling to a paste of brown needles. These are removed by suction from the mother liquor, immediately washed several times with ligroin and dried in vacuo over potash and sulphuric acid. Yield, 4g (theory, 5.5g). Mp 180° (dec.). The zinc reduction to indigo is now accomplished in glacial acetic, without using alcohol. 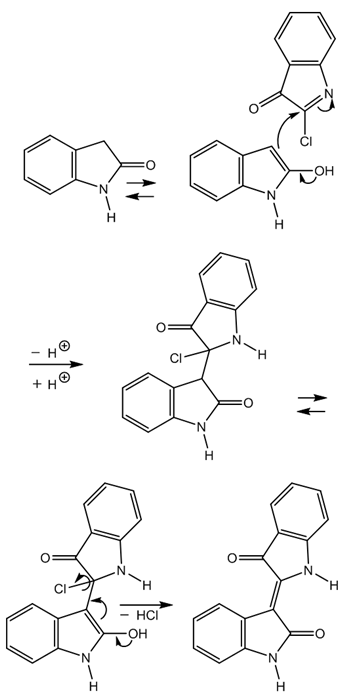 We give the mechanism in Figure 11. In other successful method, a solution of hydrogen iodide gas in glacial acetic acid is added to a solution of isatin chloride in the same solvent. With strong iodine separation, the chloride changes to indigo blue. With zinc dust is obtained from isatin chloride about 50% of blue dye, which contains the blue and the purpurin in very varying amounts, and that outweighs the purpurin usually. The purpurin is precipitated from the acetic acid solution by water and sodium carbonate. It is readily soluble in alcohol, ether, benzene and chloroform. When an alcoholic solution is diluted with water it forms crystalline flakes, and from chloroform it crystallizes in branched needles. It sublimates. Two (1972, 1974) preparations of isatin chloride (2-chloro-indolenin-3-one) are similar to the one described, with some modifications 22, 23. In a fourth paper (1881) Baeyer communicated the synthesis of indigo purpurin, which he renamed indirubin (indigo red) 24, 25. When a solution of indoxyl (3-hydroxyindole) and isatin in alcohol is mixed with sodium carbonate, the indirubin separates in brown red, metal shining needles. We give the actual trans-structure and indicate the components: the keto form of indoxyl (3-indolinone) and isatin, Figure 12. Two years later (1883) Baeyer gave the structures of indirubin and indigo 26 but he proposed cis structures. Natural indigo, isolated from different plants, has been used in the traditional Chinese medicine in order to treat respiratory viral infections, as well as other inflammatory ailments. The solid contains a high content of the blue dye but the biological activity is attributed to the red isomer, indirubin, also present 27. Indirubin stops cell migration in Glioblastoma multiforme, preventing transmission to other brain areas 28, 29. 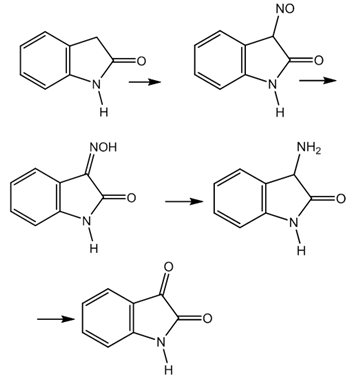 These results update the indirubin synthesis and remind us the Baeyer-Emmerling indigo synthesis. Years later than Baeyer’s studies, a new isomer of indigo was prepared in France 30 and it was named afterwards isoindigo. It was obtained as follows: a solution of oxindole (1.35g) and isatin (1.5g), i.e. 0.01 moles, in acetic acid (30 ml) containing concentrated HCl (0.5 ml) was heated in boiling water. The solution turns brown and a crystalline precipitate appears. After 2 or 3 hrs the reaction has finished. On cooling, the solid is filtered, washed with alcohol and ether. It forms red brown needles from acetic acid and melts above 350°. This isomer has a double lactam. 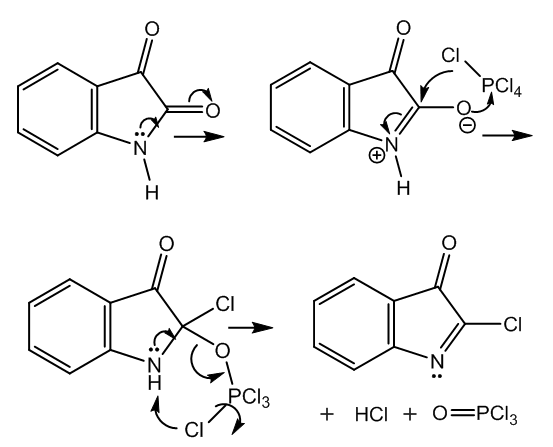 We give the reaction mechanism in Figure 13. These researchers presented a second synthesis of indirubin by condensation if isatin chloride with oxindole. To isatin chloride in benzene an equivalent of oxindole in boiling benzene is added and the solution refluxed for 2 hrs 30, 31. 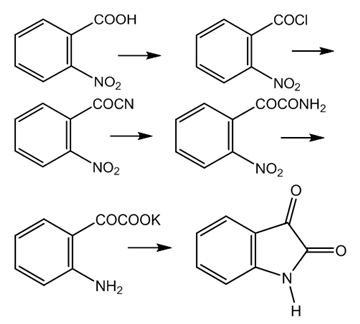 We provide the reaction mechanism in Figure 14. 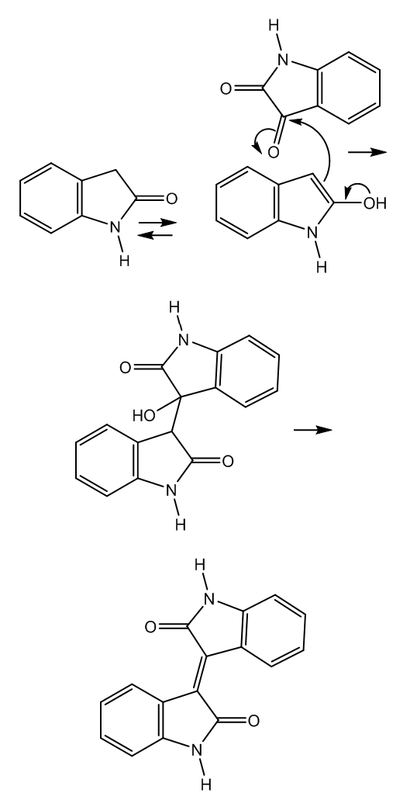 This synthesis shows how indigo purpurin (indirubin) is formed in the Baeyer-Emmerling indigo synthesis. 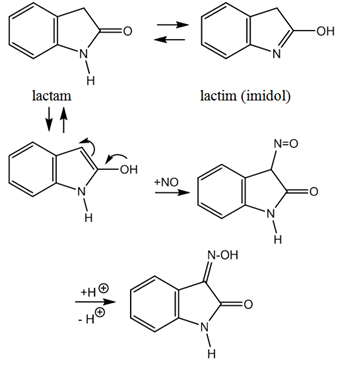 Since oxindole is required to form indirubin, that precursor must come from isatin by reduction of its keto group, more reactive than the lactam carbonyl-group. 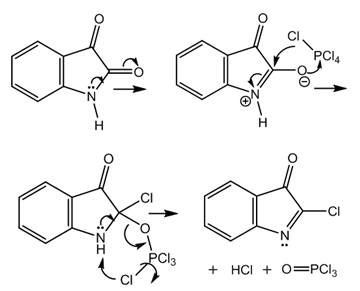 In 1985 appeared other description of this synthesis, with some variants 32. They used 2-chloroindolenin-3-one (1.65 g) and 2-indolinone (1.33 g) and were refluxed in dry toluene (40 ml) for 1 hr. The solid formed was collected, washed with toluene and recrystallized from dimethyl sulphoxide. Yield, 2.6 g (96%), m.p. > 340°. Isoindigo derivatives have also application in medicinal chemistry. 1-Methylisoindigo is used in the treatment of chronic myeloid leukemia 33. The poor solubility of this compound was improved in the N-methylpiperazino derivative. - The nitric acid oxidation of indigo to isatin accomplished by Laurent has been translated from the French and the reaction mechanism has been provided and commented thoroughly. 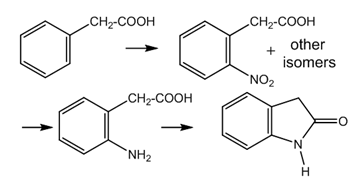 - The Baeyer oxindole synthesis is interesting because the isomeric nitro compounds obtained by an aromatic nitration were reduced to the respective amino derivatives but only the ortho isomer, in selected conditions, yielded directly the expected lactam (oxindole). 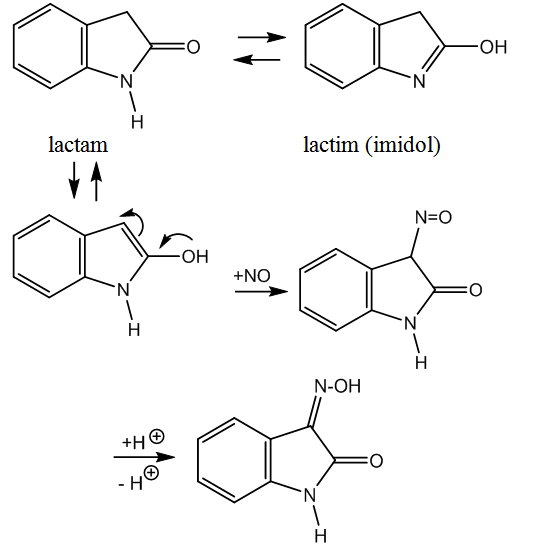 - The Baeyer isatin synthesis points out that besides the lactam-lactim isomerism in oxindole, the isomeric 2-hydroxyindole structure is needed in a nitrosation reaction. - Shortly afterwards Claisen and Shadwell presented their isatin synthesis. 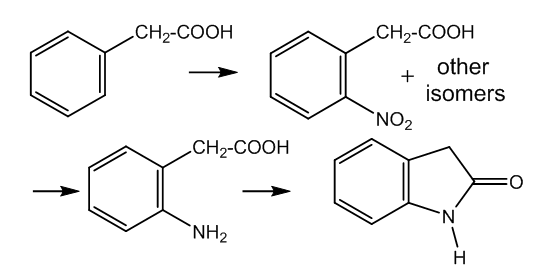 Both routes involve many steps, but since isatin is the starting compound in the Baeyer-Emmerling indigo synthesis, we include the Sandmeyer isatin synthesis, which is simpler, as well as two improvements of it, as an update of the Baeyer-Emmerling procedure. - A very recent access method to isatins from indoles has also been included. 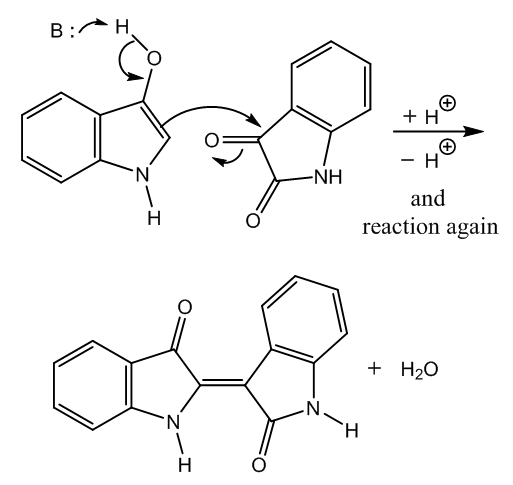 - The Baeyer-Emmerling synthesis of indigo was improved by Baeyer for ten years and resulted in a series of communications which have been already discussed. 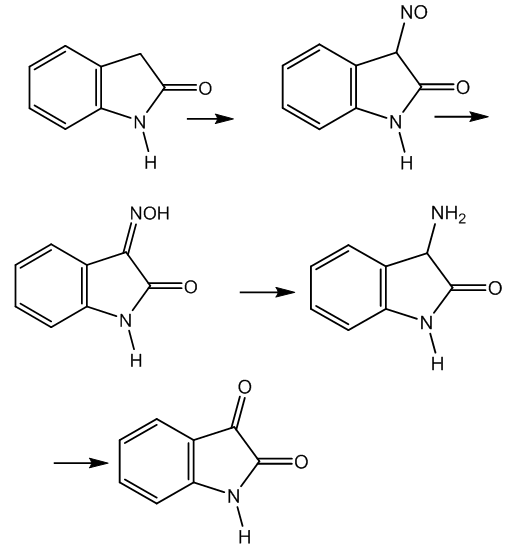 - We provided reaction mechanisms for isatin chloride formation and its reduction to indigo. - The synthesis of indigo red and of isoindigo are also treated and reaction mechanisms have been included. - Advances in Cancer Research related to the last two isomers are also mentioned. - The chemical deportment involved in the syntheses we have dealt with has been explained. Sánchez-Viesca, Francisco, and Reina Gómez. "On the Baeyer-Emmerling Synthesis of Indigo." World Journal of Organic Chemistry 6.1 (2018): 6-12. Sánchez-Viesca, F. , & Gómez, R. (2018). On the Baeyer-Emmerling Synthesis of Indigo. World Journal of Organic Chemistry, 6(1), 6-12. Sánchez-Viesca, Francisco, and Reina Gómez. "On the Baeyer-Emmerling Synthesis of Indigo." World Journal of Organic Chemistry 6, no. 1 (2018): 6-12.